Dovetailing Tip: Double the bacon. Crumble the extra and save for Bubble and Squeak on Day 4. Bring a medium saucepan of water to a boil. Gently add the eggs and cook for 6 minutes; rinse under cold water and peel. In a large skillet, cook the bacon over medium heat until crisp, 7 to 9 minutes; remove, crumble, and set aside. To the bacon drippings, add the vinegar and olive oil and stir to combine. 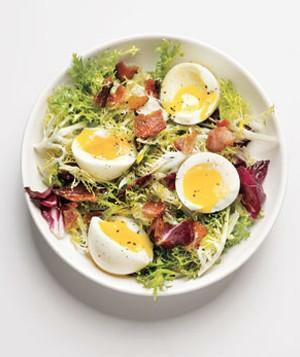 Place the frisée and radicchio in a medium bowl. Add the warm dressing and toss to combine. Serve topped with the eggs, bacon, and ¼ teaspoon pepper.